The 2016 presidential election will go down as the election that spawned a million takes. 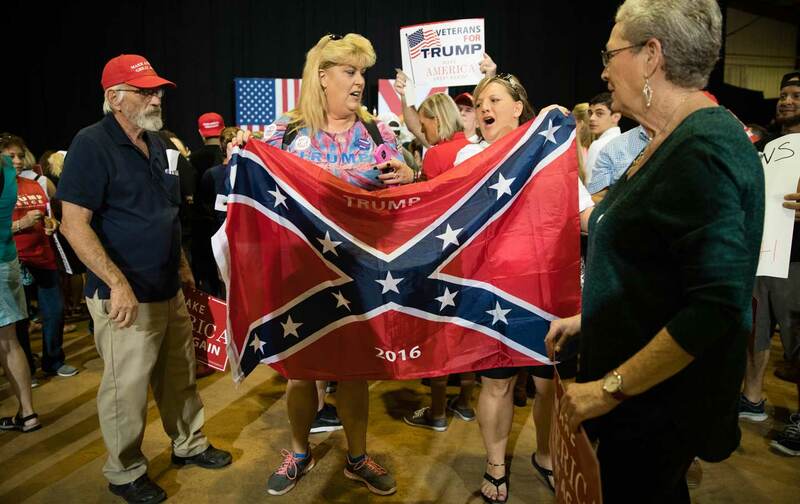 Much of this debate centered around whether the rise of Donald Trump was primarily due to economic anxiety or whether his support was an expression of resentment of racial minority groups and immigrants. In previous analyses of Trump’s support during the primaries, we showed that racial resentment played a larger role in the 2016 election than economic concerns. Recently released survey data from the Voter Study Group allows us to ascertain in what ways Trump’s general election support compares to previous elections. The data also give us the opportunity to focus in on those voters who switched from Obama in 2012 to Trump in 2016, and compare them to those voters who did not support Trump in 2016 but voted for Romney in 2012. 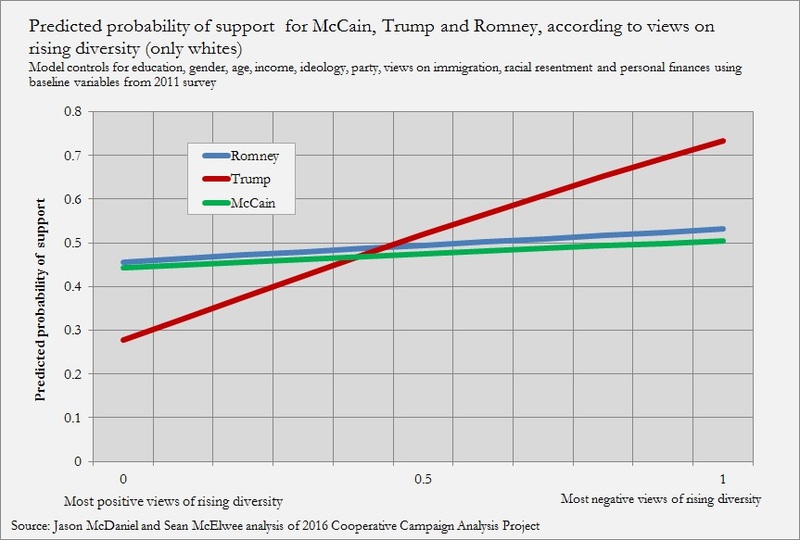 We find that opinions about how increasing racial diversity will affect American society had much more impact on support for Trump during the 2016 election compared to support for the Republican candidates in the two previous presidential elections. We also find that individuals with high levels of racial resentment were more likely to switch from Obama to Trump, but those with low racial resentment and more positive views about rising diversity voted for Romney but not Trump. In short, our analysis indicates that Donald Trump successfully leveraged existing resentment towards African Americans in combination with emerging fears of increased racial diversity in America to reshape the presidential electorate, strongly attracting nativists towards Trump and pushing some more affluent and highly educated people with more cosmopolitan views to support Hillary Clinton. Racial identity and attitudes have further displaced class as the central battleground of American politics. Research suggests, for instance, that reminding whites who have high levels of ethnic identification about rising diversity leads them to view Trump more favorably. (This finding is supported by other similar research.) 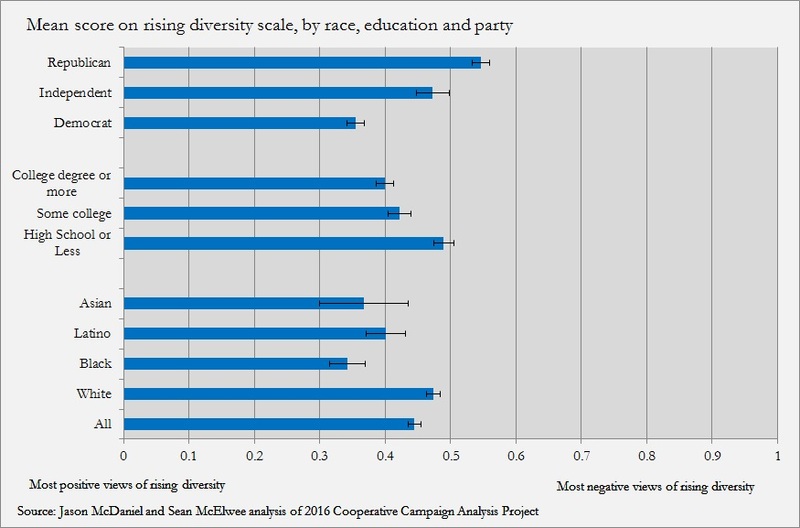 We find evidence for the idea that rising diversity helped fuel Trump’s rise in the Cooperative Congressional Analysis Project data set, a survey that interviewed respondents during both the 2012 and 2016 elections (a panel survey). Because the survey includes data on multiple elections, we can compare how views have shifted support for political candidates. Now, as you may know, census projections show that by 2043, African Americans, Latinos, Asians, and other mixed racial and ethnic groups will together be a majority of the population. Thinking about the likely impact of this coming demographic change, how much you agree or disagree with each of these statements? We combined these variables into a single measure, with 0 meaning most likely to believe that demographic change will have positive consequences and 1 indicating views that diversity will have negative consequences. As displayed in the chart below, opinions about increasing racial diversity vary across racial groups, partisan lines, and education levels. The average score on the diversity scale is .44, indicating that Americans lean towards being more optimistic about rising diversity. However, the average white person views increasing racial diversity more negatively than the average person of color in America. Whites were less optimistic about diversity, with a mean score of .47, compared to .34 for African Americans, .40 among Latinos, and .37 among Asians. Republicans and those with a high-school diploma or less exhibit the highest amount of negativity towards increasing racial diversity in America. To test how views on diversity affected voting during the 2016 election, we created a model that controls for age, race, education, income, gender, party identification, concern about rising immigration, racial resentment, and worries about personal finances. In order to provide some historical context for how Trump reshaped the electorate, we also modeled voting for Mitt Romney in 2012 and John McCain in 2008. The results, displayed in the chart below, show that probability of support for Trump increases sharply with negative views on rising diversity, and positive views towards diversity decrease the probability of voting for Trump. Interestingly, these attitudes have no significant effect on probability of voting for Romney or McCain. While race and racial attitudes have been and continue to play an important role in support for Republican presidential candidates, fears about growing racial diversity appear to be uniquely important to support for Trump compared to previous Republican candidates. Although our analysis does not speak to whether these attitudes were primed by Trump’s campaign, or whether he capitalized on emergent attitudes and rode them to victory, it seems clear that they will play a key role in the future of the Republican Party. Our analysis also shows that seeing racial diversity as a threat also helps to explain what motivated those voters who switched from voting for Barack Obama in 2012 to voting for Trump in 2016. The CCAP data indicate that 9 percent of Obama 2012 voters switched to Trump in 2016, and about 5 percent of Romney 2012 voters defected from Trump by voting for Hillary Clinton, and 6 percent voted for another candidate. 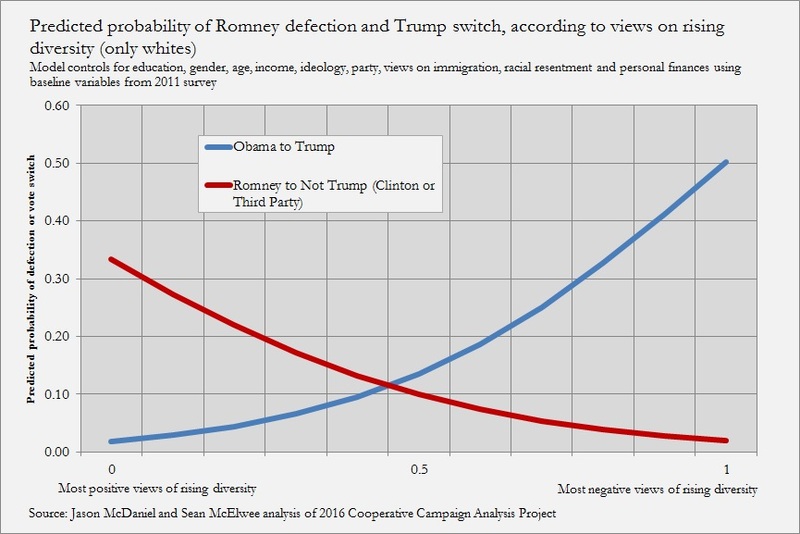 Perceiving growing racial diversity as a threat strongly predicts Obama to Trump vote switchers, and more positive attitudes towards diversity predict the probability that a Romney 2012 voter would defect from the Republican nominee in 2016. The chart below shows that among whites most accepting of diversity there was a predicted 33 percent chance of defecting, compared to a 2 percent chance for whites with the most negative views about rising diversity. Among whites with the most positive views of rising diversity, the model predicts a less than 2 percent chance of an Obama voter’s voting for Trump. This compares to a 50 percent chance of voting for Trump among whites with the most negative views of rising diversity. Moreover, our analysis indicates that these attitudes had a stronger effect on vote switchers than any other variable, including racial resentment and attitudes towards immigration. Additional analysis reveals differences between white Republican and Democratic identifiers who switched from Obama to Trump. Seeing diversity as a threat had a particularly strong effect on white Republican identifiers who switched from Obama to Trump, but a comparatively modest effect on white Democratic switchers. Similarly, racial resentment towards blacks had a stronger impact on the probability of Obama-to-Trump vote switching for white Republicans compared to white Democrats. Fears about immigration were also linked to Trump support. However, we find little evidence to support the idea that concerns about trade deals or a rigged system contributed significantly to a Trump victory. Neither the trade-policy baseline question nor a scale of questions about trade policy predicted Trump support. Questions about whether the political system benefits wealthy elites predicted vote choice—but in the wrong direction. People who agreed that the system benefited powerful elites were more likely to reject Trump. Increasingly, class is simply not a meaningful dimension along which American politics is fought. In our regressions, income predicted support for McCain and Romney, but not Trump. Rather, the battle-lines are drawn around issues of racial identity and tolerance of diversity. Research suggests that high-income people of color are more supportive of the Democratic Party than low-income whites. In the 2016 election, the traditional Democratic advantage among low-income people was deeply diminished. Corporations, long seen as the enemy for progressives, are increasingly seen as allies on issues like immigration and LGBT rights. Unions, once the backbone of the Democratic Party, have waned in influence, and many found their members receptive to Trump’s message. On the right, nativism has stalled hopes for immigration reform among the party’s business wing. Trump’s early days in office are not those of a politician concerned about class. Rather, Trump has aggressively worked to enshrine favoritism for straight, white male Christians as the law of the land. The North American Free Trade Agreement, jobs, and infrastructure spending quickly fell off of his agenda, to be replaced by deportations, attacks on trans students and immigrants, coupled with obscure deregulatory measures to appease the business class. Perhaps socialism never took hold in the United States is because workers believe themselves to be “temporarily embarrassed millionaires,” as a popular saying goes. There is certainly evidence of this. But another explanation is that, throughout history, divides within the working class have been more salient than divides between the working class and the rich. Race, gender, immigration status, and religious status have served as such wedges. Right-wing movements are rising in places with radically different economic systems. From the laissez-faire United States, to the more government-dominated France, to England and the Nordic social democracies. The former Soviet Bloc members that were once seen as evidence of the power of the mixed-economy, such as Hungary and Poland, have seen a rise in right-wing parties. It doesn’t matter whether the middle class is shrinking or growing: India, the poster child for globalization, has also seen rising populist authoritarianism. Politics in the United States and much of the globe is now defined by the questions of tolerance and diversity. Progressives still embrace an economically liberal program, but Obama’s election and Trump’s rise has raised more urgent questions about whether the country should have an open or closed society. This helps explain the Democratic coalition, which consists of young people, people of color, unmarried women, LGBT people as well as Silicon Valley tech titans. It explains why Clinton faltered with non-college whites while bringing in more upscale, college-educated voters who traditionally voted for Romney. The current trajectory is towards a political system in which battles about class interest are obfuscated by a clash over the openness of society. Jason McDanielJason McDaniel is an associate professor of political science at San Francisco State University. He tweets at @ValisJason.